(1) The son of Vyâsadeva said: 'From Urvas'î's womb six sons were born who were begotten by Purûravâ, oh ruler of man: Âyu, S'rutâyu, Satyâyu, Raya, Vijaya and Jaya. (2-3) S'rutâyu had a son named Vasumân, Satyâyu also had one called S'rutañjaya, from Raya there was a son called Eka and from Jaya there was a son called Amita. Bhîma was the son of Vijaya after whom Kâñcana was born as his son. From Hotraka, Kâñcana's son, there was the son Jahnu who drank the water of the Ganges in one sip. (4) Puru was begotten by Jahnu [see 1.12: 15 & 3.8: 1] and from him next Balâka and his son Ajaka appeared. Kus'a followed from whose loins the four sons Kus'âmbu, Tanaya, Vasu and Kus'anâbha were born who were succeeded by Gâdhi, the son of Kus'âmbu. (5-6) From Gâdhi there was the daughter Satyavatî who by the brahmin Ricîka was asked to be his wife, but not considering him fit king Gâdhi said to that son of Bhrigu: 'Please deliver me as a dowry for this daughter of the Kus'a dynasty that we belong to, one thousand horses as brilliant as the light of the moon with each one black ear.' (7) With that being said the sage understood what he had in mind. He went to the abode of Varuna from where he brought and delivered the horses. Then he married the beautiful daughter. (8) He as a seer was by his wife and his mother-in-law who each wanted a son, requested to cook a preparation which he with mantras offered to them [to his wife with a brâhmana mantra and to his mother-in-law with a kshatriya mantra]. Then the muni went away for a bath. (9) Meanwhile, Satyavatî was by her mother asked to give the oblation that was meant for her, because she thought it was the better one of the two. She handed it over to her while she herself ate her mother's oblation. (16) The honorable king said: 'What was, of those degraded nobles out of control, the offense committed unto the Supreme Lord because of which time and again the dynasty was annihilated? (17-19) The son of Vyâsa said: 'The king of the Haihayas, Kârtavîryârjuna, the best of the kshatriyas, had developed a thousand arms in upholding the worship of Dattâtreya who is a plenary portion of Nârâyana. He who was the fear of his enemies could not be defeated, was sharp-witted, most attractive, influential, powerful, renown and physically very strong. Because of his yogic control he had acquired qualities like the perfections of the animâ-siddhi and such and he tirelessly traveled all over the world like a whirlwind. (20) When he one day surrounded by beautiful women enjoyed the water of the Revâ [the Narmadâ], he, overly proud of being decorated with the garland of victory, with his arms stopped the flow of the river. (21) The conceited hero called Ten-head [Râvana] could not bear that influence because the water that moved upstream from his actions had inundated his camp. (22) Râvana who insulted him [the king] in the presence of the women was without much difficulty arrested by him, held in custody in [their capital] Mâhishmatî and then released again as if it concerned a monkey. Third revised edition, loaded February 7, 2013. The son of Vyâsadeva said: 'From Urvas'î's womb six sons were born who were begotten by Purûravâ, oh ruler of man: Âyu, S'rutâyu, Satyâyu, Raya, Vijaya and Jaya. S'rutâyu had a son named Vasumân, Satyâyu also had one called S'rutañjaya, from Raya there was a son called Eka and from Jaya there was a son called Amita. Bhîma was the son of Vijaya after whom Kâñcana was born as his son. From Hotraka, Kâñcana's son, there was the son Jahnu who drank the water of the Ganges in one sip. Puru was begotten by Jahnu [see 1.12: 15 & 3.8: 1] and from him next Balâka and his son Ajaka appeared. Kus'a followed from whose loins the four sons Kus'âmbu, Tanaya, Vasu and Kus'anâbha were born who were succeeded by Gâdhi, the son of Kus'âmbu. With that being said the sage understood what he had in mind. He went to the abode of Varuna from where he brought and delivered the horses. Then he married the beautiful daughter. He as a seer was by his wife and his mother-in-law who each wanted a son, requested to cook a preparation which he with mantras offered to them [to his wife with a brâhmana mantra and to his mother-in-law with a kshatriya mantra]. Then the muni went away for a bath. Meanwhile, Satyavatî was by her mother asked to give the oblation that was meant for her, because she thought it was the better one of the two. She handed it over to her while she herself ate her mother's oblation. Satyavatî beseeched him that it would not be so and thus the son of Bhrigu said: 'Then the son of your son will be that way!' Thereafter Jamadagni was born. She [Satyavatî] later became the great and sacred Kaus'ikî [a river] that purifies the entire world. Jamadagni married Renukâ, the daughter of Renu. She with the seer of Bhrigu gave birth to many sons of whom Vasumân was the eldest. The renown Paras'urâma [also known as Râma] was the youngest son. He [Paras'urâma] who twenty-one times acted as the annihilator of the Haihaya dynasty and thus freed the earth from all her kshatriyas, is called an [ams'a] incarnation of Vâsudeva. The honorable king said: 'What was, of those degraded nobles out of control, the offense committed unto the Supreme Lord because of which time and again the dynasty was annihilated? The son of Vyâsa said: 'The king of the Haihayas, Kârtavîryârjuna, the best of the kshatriyas, had developed a thousand arms in upholding the worship of Dattâtreya who is a plenary portion of Nârâyana. He who was the fear of his enemies could not be defeated, was sharp-witted, most attractive, influential, powerful, renown and physically very strong. Because of his yogic control he had acquired qualities like the perfections of the animâ-siddhi and such and he tirelessly traveled all over the world like a whirlwind. When he one day surrounded by beautiful women enjoyed the water of the Revâ [the Narmadâ], he, overly proud of being decorated with the garland of victory, with his arms stopped the flow of the river. The conceited hero called Ten-head [Râvana] could not bear that influence because the water that moved upstream from his actions had inundated his camp. Râvana who insulted him [the king] in the presence of the women was without much difficulty arrested by him, held in custody in [their capital] Mâhishmatî and then released again as if it concerned a monkey. 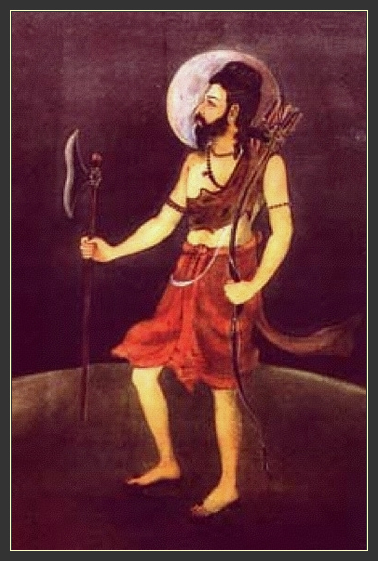 Once during a hunt alone in the forest wandering aimlessly, he [Kârtavîryârjuna] entered the âs'rama of Jamadagni muni. The sage on the basis of his austerity could, because of his cow of plenty [kâmadhenu], offer to that god of man together with his soldiers, ministers and the rest of his retinue, everything that was needed. When the king saw what this wealth that exceeded his personal opulence all meant, he could not appreciate it really. He and his Haihayas then developed the desire to possess that cow of sacrifice. In his conceit he encouraged his men to take away the sage's cow of plenty and bring her together with her calf to Mâhishmatî while it was crying because of the violence. After the king was gone Paras'urâma, upon returning to the âs'rama [of his father], heard about that nefarious act and got as angry as a snake that is trampled upon. Unable to tolerate what had happened he took up a ghastly chopper, a quiver, a bow and a shield and went after them like a lion attacking an elephant. As the king entered the capital he saw the best of the Bhrigus coming after him in fury carrying a bow, arrows and a chopper as his weapons. His skin was covered by a black deerskin, he had matted locks and radiated like sunshine. He sent seventeen akshauhinîs [*] with elephants, chariots, horses and infantry, with swords, arrows, lances, slings and weapons of fire, but Paras'urâma, the Lord and Master, most fiercely killed them all by himself. He as the greatest expert in handling the chopper, killed as fast as the wind and as speedy as the mind the enemy troops from whom here and there the arms, legs and shoulders fell to the ground together with the drivers of the elephants and the horses that had been slain. Seeing his soldiers fallen by the axe and the arrows of Râma lying scattered with their shields, flags, bows and dead bodies in the mud and the blood on the field, Haihaya [Kârtavîryârjuna] rushed over there in fury. Kârtavîryârjuna then fixed with five hundred of his arms simultaneously as many arrows on as many bows in order to kill Râma, but he as the best fighter of all the ones armed, cut them all to pieces with his arrows using one bow only. The king attacked again with trees and rocks that he had uprooted with his hands, but, as he was rushing forwards on the battlefield, all his arms were by Paras'urâma's razor-sharp axe with great force cut off like they were the hoods of snakes. After his arms had been cut off, the mountain peak that was his head was severed. As soon as their father was killed his ten thousand sons fled away in fear. Fetching the sacrificial cow and calf that had suffered badly, the Killer of All False Heroism returned to his father's hermitage and handed them over to him. 'Râma, oh Râma, mighty hero, you have committed a sin by unnecessarily killing that god of man who embodies all the demigods. We are brahmins my dear one, people who because of their forgiveness have achieved a position of respect. It is by this quality that the god who is the spiritual master of the universe [Lord Brahmâ] has achieved his position as the supreme authority. By forgiveness the splendor, happiness and success of the religious practice shines as brilliant as the sun. The Supreme Lord Hari, our Controller, becomes quickly pleased with those who are forgiving. To kill a king who is famous as an emperor is worse than killing a brahmin. Therefore wash away that sin my best one, by respecting the holy places in the consciousness of the Infallible One. *: The Mahâbhârata describes an akshauhinî in the Âdi parva, chapter two: "One chariot, one elephant, five infantry soldiers and three horses are called a patti by those who are learned in the science. The wise also know that a senâmukha is three times what a patti is. Three senâmukhas are known as one gulma, three gulmas are called a gana, and three ganas are called a vâhinî. Three vâhinîs have been referred to by the learned as a pritanâ, three pritanâs equal one camû, and three camûs equal one anîkinî. The wise refer to ten anîkinîs as one akshauhinî. The chariots of an akshauhinî have been calculated at 21.870 by those who know the science of such calculations, oh best of the twice-born, and the number of elephants is the same. The number of infantry soldiers is 109.350, and the number of horses is 65.610. This is called an akshauhinî." The picture shows Paras'urâma. Source.